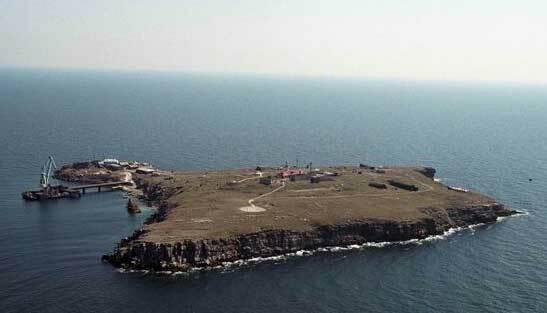 The Ukraine claimed the island to be a 'coastal' zone which would thus enlarge its maritime border lines. Romania argued that the island was not coastal and would thus give Romania greater territorial rights over Black Sea surfaces. 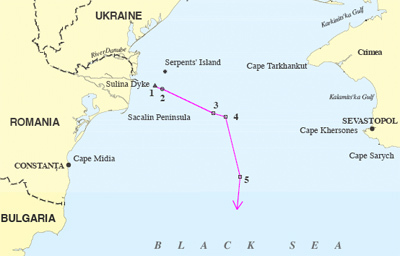 Excerpt from Paragraph 148:To count Serpents’ Island as a relevant part of the coast would amount to grafting an extraneous element onto Ukraine’s coastline; the consequence would be a judicial refashioning of geography, which neither the law nor practice of maritime delimitation authorizes. The Court is thus of the view that Serpents’ Island cannot be taken to form part of Ukraine’s coastal configuration (cf. the islet of Filfla in the case concerning Continental Shelf (Libyan Arab Jamahiriya/Malta), Judgment, I.C.J. Reports 1985, p. 13). 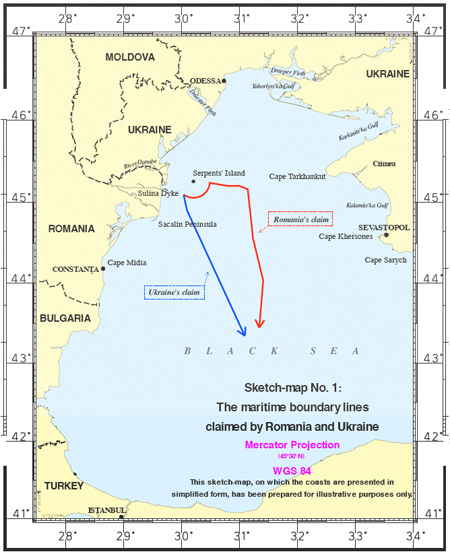 Decides that starting from Point 1, as agreed by the Parties in Article 1 of the 2003 State Border Régime Treaty, the line of the single maritime boundary delimiting the continental shelf and the exclusive economic zones of Romania and Ukraine in the Black Sea shall follow the 12-nautical-mile arc of the territorial sea of Ukraine around Serpents’ Island until Point 2 (with co-ordinates 45° 03' 18.5" N and 30° 09' 24.6" E) where the arc intersects with the line equidistant from Romania’s and Ukraine’s adjacent coasts. From Point 2 the boundary line shall follow the equidistance line through Points 3 (with co-ordinates 44° 46' 38.7" N and 30° 58' 37.3" E) and 4 (with co-ordinates 44° 44' 13.4" N and 31° 10' 27.7" E) until it reaches Point 5 (with co-ordinates 44° 02' 53.0" N and 31° 24' 35.0" E). From Point 5 the maritime boundary line shall continue along the line equidistant from the opposite coasts of Romania and Ukraine in a southerly direction starting at a geodetic azimuth of 185° 23' 54.5" until it reaches the area where the rights of third States may be affected. "BP and Royal Dutch/Shell signed prospect contracts with Ukraine, while Total with Romania. Austrian OMV (the owner of Romania's largest oil company, Petrom) also signed a contract with Naftogaz Ukrainy and Chornomornaftogaz to jointly participate to an auction for a concession of the area." "According to the official estimates, the entire area holds reserves of approximately 100 bcm of natural gas and 10-15 million tons of oil. ‘These are the estimated reserves. It is difficult to say what Romania’s share is. We could be talking about 70 bcm, maybe more’ the ANRM official said. Moreover, ‘Ziua’ daily wrote that the oil industry giants are already calling in Romania. Total, Royal Dutch Shell, BP but also other local consortiums such as OMV are interested in exploiting the reserves, Hotnews.ro informs. The exploitation of hydrocarbon reserves is done on the basis of public tenders. According to the specialists, an oil and natural gas pocket cannot be pumped dry, with the maritime platforms being able to tap into around 25-30 per cent of the existing fossil fuel quantities. In other words, the natural gas reserves estimated at 70 billion cubic meters could fully satisfy Romania’s consumption for a year and a half." NOTE: The legality of concessions authorized by the Romanian government to Sterling Resources Ltd (Canada) is being challenged. "The island was named, by the Greeks Leuce Island ("White Island"), similarly known by Romans as Alba, probably because of the white marble formations that can be found on the isle. 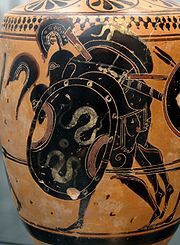 The uninhabited Isle Achilleis ("of Achilles") was the major sanctuary of the Achaean hero, where "seabirds dipped their wings in water to sweep the temples clean" (Kyriazis). Several temples of Thracian Apollo can be found here, and there are submerged ruins. According to an epitome of the lost Trojan War epic of Arktinos, the remains of Achilles and Patroclus were brought to this island by Thetis, to be put in a sanctuary. Ruins believed to be of a square temple dedicated to Achilles, 30 meters to a side, were discovered by Captain Kritzikly in 1823. Ovid, who was banished to Tomis, mentions the island; so do Ptolemy and Strabo. The island is described in Pliny's Natural History, IV.27.1. "Several ancient inscriptions were found on the island, including a 4th century BC Olbiopolitan decree which praises someone for defeating and driving out the pirates that lived on the "holy island".